This table is kept up to date by ITU(International Telecomunication Union). Questa lista è aggiornata da ITU(International Telecomunication Union). DXCC List March 2016 Edition. DXCC Deleted List March 2016 Edition. These lists are kept up to date by ARRL (American Relay Radio Legue). This table is kept up to date by DARC (Deutschen Amateur-Radio-Club e.V.). Questa lista è aggiornata da DARC (Deutschen Amateur-Radio-Club e.V.). This list is kept up to date by ARI (Associazione Radioamatori Italiani). 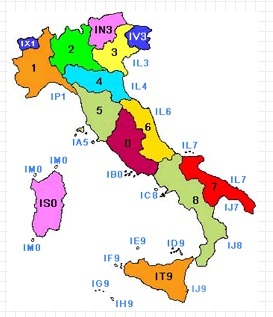 Italian call areas. Click to enlarge. NOAA (National Oceanic and Atmospheric Administration). SWPC (National Space Weather Prediction Center).